As the Internet of Things (IoT) continues to revolutionize the way we connect and interact with our devices, there are a number of network options on which to build smart solutions. The most talked about low power wide area networks (or LPWANs) are narrow band IoT (NB-IoT) and LoRaWAN™. Developed for long range communication between devices and the Cloud using cellular infrastructure, NB-IoT is compatible with LTE mobile networks. LoRaWAN utilizes the sub-gigahertz unlicensed radio spectrum bands to enable LPWAN communication between sensors and gateways connected to a network and application servers in the Cloud. A Semtech innovation, LoRa devices and wireless RF technology (LoRa Technology) is quickly becoming the de facto platform for IoT and enables a wide variety of solutions in many verticals through its compelling mix of long range and low power. IoT is all about solving real world problems and improving efficiencies using the right technology. 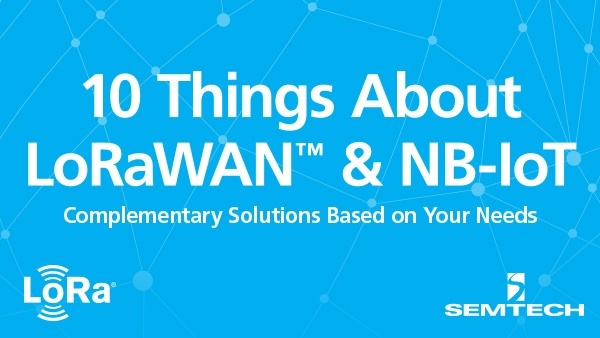 When creating an IoT application of your own, there are several factors to consider including LPWAN connectivity. Below we’ve compared LoRaWAN and NB-IoT side by side! LoRaWAN is supported by the LoRa Alliance™, an open, non-profit association of more than 500 members. Its members closely collaborate and share experiences to promote and drive the success of the LoRaWAN protocol as the leading open global standard for secure, carrier-grade IoT LPWAN connectivity. NB-IoT is supported by the 3rd Generation Partnership Project (3GPP) and GSMA, two telecommunications standards associations that have the shared goals of advancing the interests of cellular networks and devices. LoRaWAN is optimized for ultra-low power and long range applications. As such, the network operates on an unlicensed ISM sub-1 GHz spectrum network which is free to access for both network operators and device manufacturers. NB-IoT uses a cellular spectrum network which is optimized for spectrum efficiency over everything else as license fees for use of the frequency bands are very high and limited to a few licensees that can afford to pay for it. According to the LoRa Alliance, 83 public network operators in 49 countries are using LoRaWAN today, with many more private enterprise networks running on LoRaWAN as well. GSMA, the organization representing the interests of NB-IoT, LTE, and other mobile networks, claims that 40 countries are expected to roll out NB-IoT networks in the near future. LoRaWAN networks offer highly flexible deployment. This means they can be installed in public, private, or hybrid networks, indoors or outdoors. LoRaWAN signals are able to penetrate deep in urban installations, and can cover up to 30 miles per gateway in rural, open environments. NB-IoT utilizes LTE cellular infrastructure. This means the networks are outdoor public networks where there are 4G/LTE cellular towers. Base stations cannot be easily located elsewhere even if sensors are out of range of the base station. The LoRaWAN protocol allows data to be sent asynchronously, meaning data is only sent when necessary. This extends battery life of sensor devices in the field by as much as 10 years, keeping battery replacement costs low. NB-IoT maintains a synchronous connection to the cellular network regardless if there is data present to send. This consumes considerable battery life for sensor devices, resulting in high battery replacement costs, which can be cost prohibitive in many applications. LoRaWAN offers a transmit current of 18 mA at 10 dBm and 84 mA at 20 dBm. Differences in modulation allow LoRaWAN to be supported by very low cost batteries, including coin cells. NB-IoT sensors consume ~220 mA at 23 dBm and 100 mA at 13 dBm, meaning it requires more power to operate and needs more frequent battery replacements or larger batteries. LoRaWAN provides lower sensor BOM costs and battery life for remote sensors. A receive current of ~5 mA means LoRaWAN operates at 3-5x lower power overall. NB-IoT operates a receive current at ~40 mA. Communication between cell network and device consumes over 110 mA on average, lasting tens of seconds at a time. Protocol overhead has significant impact on battery life for devices that require 3, 5 or 10+ years of operation. LoRaWAN features a data rate of ~293 bps-50 kbps. The LoRaWAN protocol adapts data rate dynamically depending on how far the sensor is from the gateway thus optimizing time-on-air of the signal and reducing collisions. NB-IoT runs a peak data rate of ~250 kbps, and is better suited for higher data rate use cases (above 50 kbps) with a higher power budget. The MCL signal of LoRaWAN varies depending on regional regulatory limits. Link budget falls between 155 dB and 170 dB best case. NB-IoT requires significant repetition for remote sensors at a low bit rate to be able to support remote sensors. Link budget rests at 164 dB best case. LoRaWAN can support mobile sensors and track them as assets move from one location to another. This can be done even without GPS with good enough accuracy for many applications. NB-IoT is limited to idle mode cell reselection today which is not well optimized for mobile asset tracking. Download an infographic summarizing the information in this blog. LoRaWAN offers state of the art battery life and applications into nearly any vertical market. Are you interested in utilizing LoRa Technology in your IoT application? Interested in converting your existing IoT sensor application to LoRa Technology? Download the “Migrating an IoT Sensor Design to LoRaWAN” white paper. Vivek is the Director of Wireless Products for Semtech's Wireless and Sensing Products Group. This includes the award-winning LoRa product line.